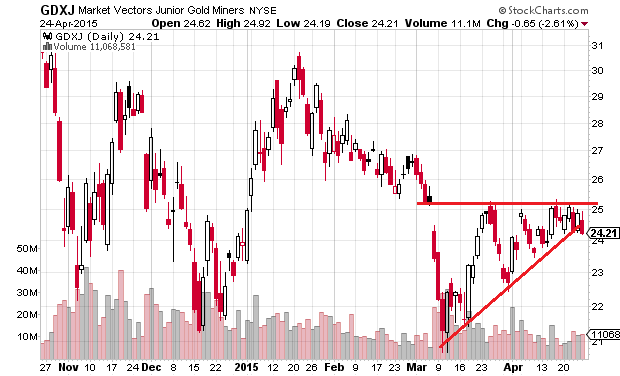 Junior gold mining stocks have been consolidating since March. The index I'm looking at is GDXJ. The consolidation is very clean and well defined. It's a triangle pennant. 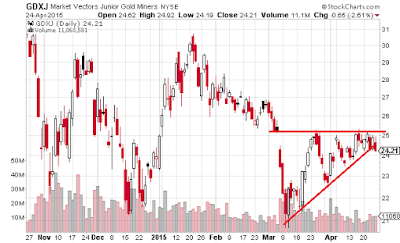 The triangle is ascending which is bullish, however the move off the end of the triangle is all that matters. It looks right now that it is going down. I'm going to put a buy stop order for JDST around mid 9.50s which is the 3 X bearish ETF. I'm going to scale in small at first though as it doesn't look confirmed yet.